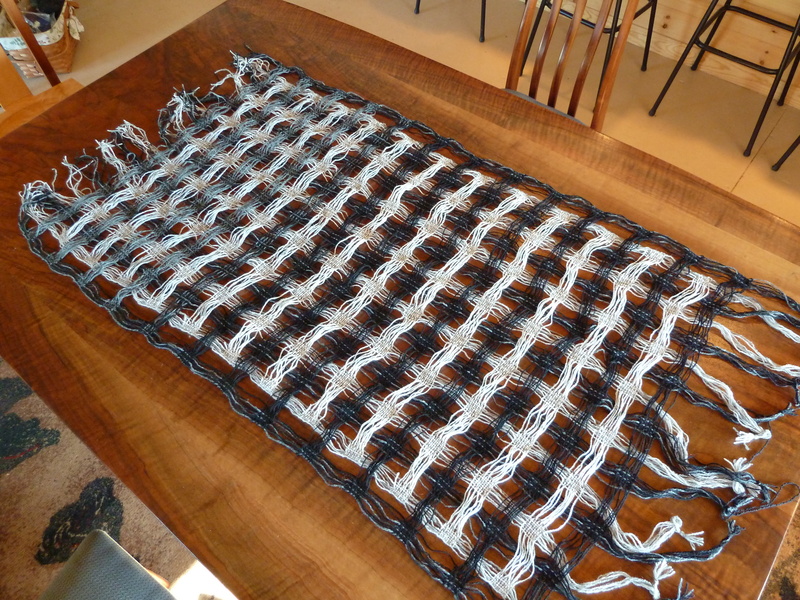 Yesterday was a 12-hour weaving day – winding warps, tie on to the previous warp, wind on, weave weave weave the next piece for the wall-hangings I am doing for the show at Confluence Gallery. I felted the first one on Wednesday and it turned out OK! I was so uncertain it was even going to work. 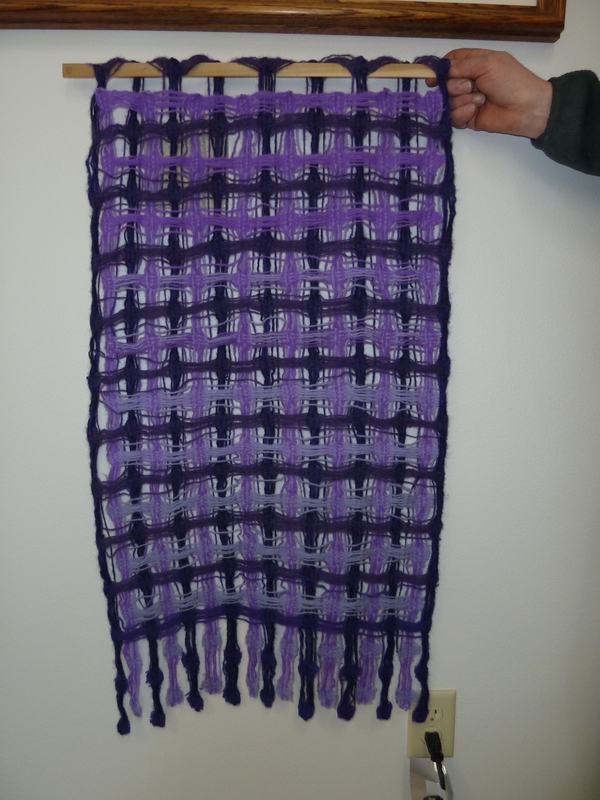 These are actually a kind of double-weave, each color is woven separately but they interlace. I am using Shetland 2-ply yarn (the kind you would knit a Fairisle sweater from) – I bought a big mixed bag of colors from a friend at the knitting retreat a couple of years ago at the stash reduction sale. So I had a lot of colors to choose from and it wasn’t expensive, so risking completely ruining it in an experiment seemed OK.
Encouraged by the way the first one turned out (about 30-40% shrinkage) I went ahead and wove 2 more. One is blue/green and the other is black & white (with some greys). 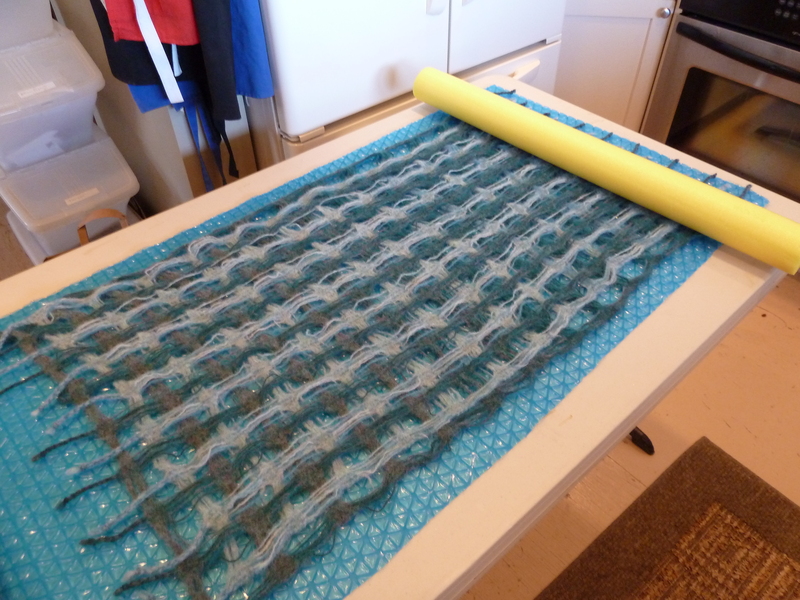 The blue mat is spa cover material and has a waffle texture on one side, which provides just the right amount of rubbing and friction to continue the felting. Then you use a “water noodle” (flotation device) to roll the package around. Sprinkle on some hot soapy water and roll – and roll – and roll. 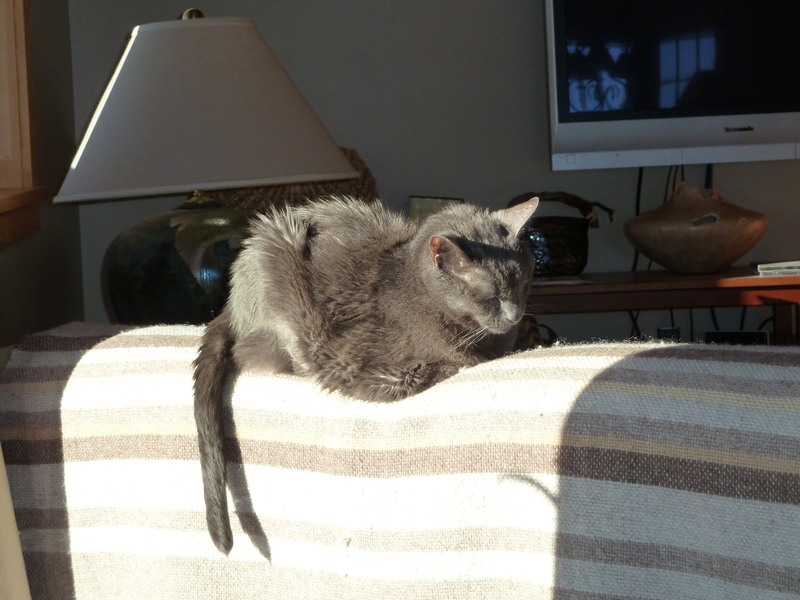 Take it out, rinse, check, roll some more. 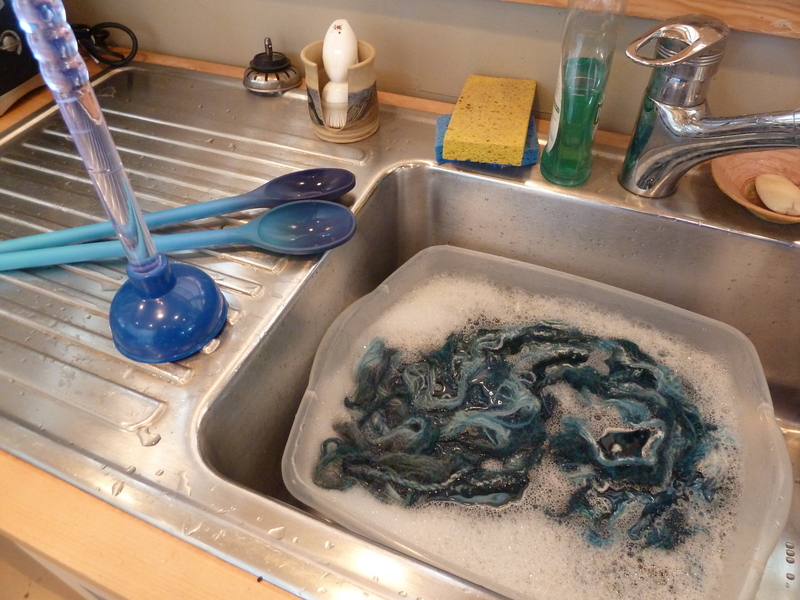 It took a total of 2-3 hours to get these down to where I wanted them (from initial soak to final rolling and rinsing). But I needed to get the weaving and felting done this week before I leave for Orcas Island and spinning camp with the fabulous Judith MacKenzie – bright and early tomorrow morning. I am not done with these pieces yet, they are going to be embellished. I will be working on that part while gone next week, then do the final assembly when I get home. 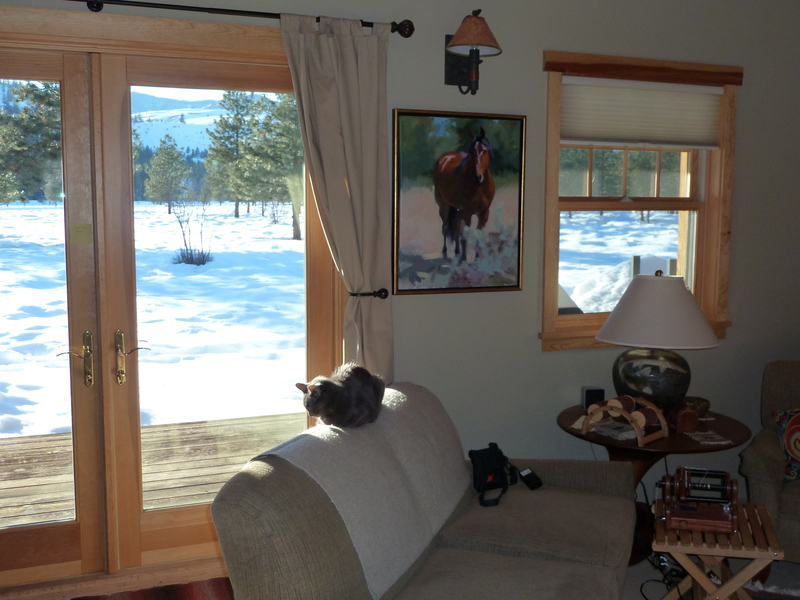 The show opens March 5 and here’s an article from the Methow Arts website about the show, with a wee small blurb about me and my friend Sara Ashford.